If a lotus plant (water lily) is given to us (Southern Chinese), we'd just eat the whole thing up - seed in dessert, root in soup, dried flower in meat, stem in salad, embryos and stamens for medicine, leaf for flavoring... The seed and root I used to eat a lot although I didn't find them have any taste. The leaves are a different story though. Dim sum chefs use them to wrap the rice for steaming as the leaves give out a fantastic dark tea-alike aroma and color to the grains. In old time people stuffed in a lot of ingredients -- rice, a chunk of chicken (usually bone-in), fatty pork, dried shrimp, mushroom, bamboo shoot and sometime an egg; it filled people up getting ready for a long day of (labor) work. But nowaday, probably due to the diet trend, or we no longer getting hungry easily (coffee and donut break at 10:30 you know...), this dish from the size of Big Mac (times 2) slims down to an egg's. Presentation has changed, but the classic and enveloping aroma is timeless. Hongkong Chinese mostly use glutinous rice (sticky and waxy in texture) for making this dish, but I tried another popular long-grain, Jasmine rice (firm and fluffy) which also gave me a very satisfactory result. Whichever grain you prefer, you should adjust the time in soaking and steaming. The following recipe is just a basic and contains no meat as I aim to a light side dish. Please feel free to add anything to your liking. In a medium pot, bring the water to boil. Turn off the heat. Add the rice and make sure the water has to be above the rice 3 cm at least. Soak for half day. Drain the rice. In a big bowl, mix with the rice with chicken powder, oil, sesame oil, and salt. 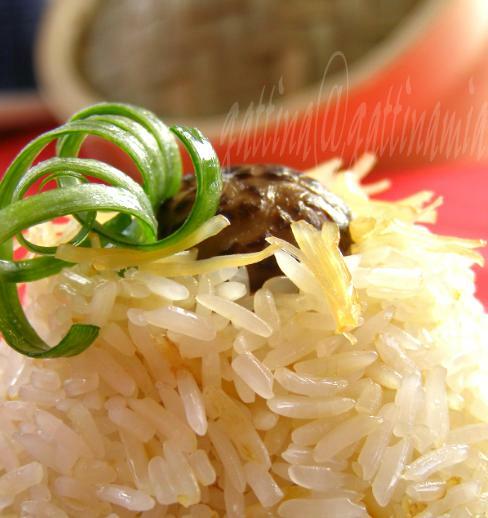 Scoop some rice onto a piece of leaf, lay in scallop, mushroom and a piece of spring onion, scoop more rice to cover. Wrap up the leaf, you're aiming for a square shape. You don't need to tight up the stuffed leaves, just turn the seam side down laying on a steamer. After the water boils, steam the rice for about 25 minutes over medium heat, depending on the amount of rice. Serve hot, goes with any seafood and meat dish. I am going to send this post to my favorite weekly event Weekend Herb Blogging found by our lovely Kalyn. This week she hands the baton all the way to Milan as Piperita is the guest hostess. See you guys at the recap! I love the sound of this. Is lotus leaf a special leaf or any water lily? My mum has some water lily in her pond... hehe. I really smell the aroma of scallops and lotus leaves. I guess what banana leaves is to us, Indians is lotus leaves to chinese. Fish steamed in banana is a very famous dish. Great work as usual. Loved ur write up ! Gattina,gorgeous presentation! I 've never tried this..seems to be an Aromatic steamed rice to be relished with every morsel.. I remember eating lots these when I was young. Oh how I miss it. Yours looks terrific and were the perfect thing to satiate my nostalgia. I've never eaten lotus palnt...I want to try! 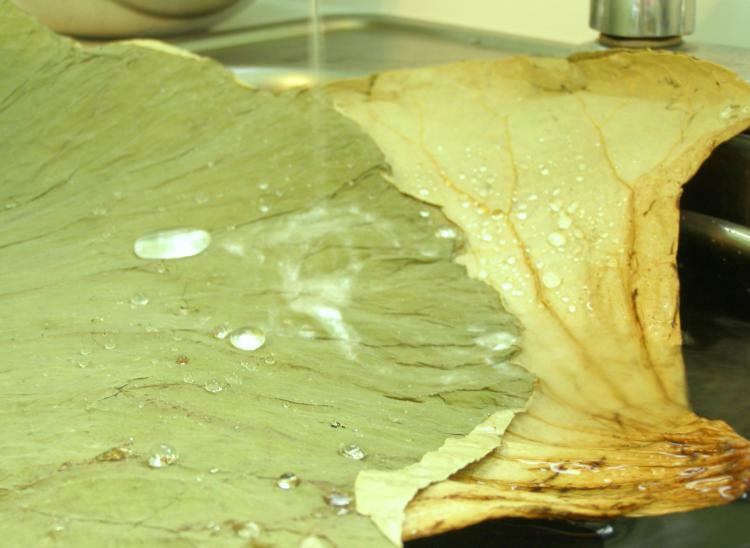 The aroma from your lotus leaf 'package' is travelling all the way to Singapore ;p What a nice dish! Gattina, lovely pictures! I know some in some parts of india, lotus stem is a delicacy. This is certainly a treat. Thanks for sharing. mae, I checked my pack but it didn't say the origin and a clear name. Now I envy your mom... it's my dream of having a nice pond with water lily in my garden! Revathi, agree with you! I can't resist anything with banana leaves under BBQ! Haripriya, thanks for your visit :D Sorry I don't know anything about Thail. Lera, thanks for your compliement! Grace... here it comes... and gotcha your butter cake! saffron, thanks! Even just looking at this plant, I'm already very happy. Angie, thanks for your sweet words! Mandira, thanks for your info too! I love your cuisine a lot! Enriched with flavors, culture and histry! oh I love ordering this at dim sum! I never tried making it at home though. Your photo looks lovely. WOW!! Lotus leaves!! I never knew you could cook with those!! Well now! all I need to get is lotus leaves. But where O where? Seriously, photos are wonderful, wish I could taste some !! Thanks Gattina! There is something very special about your photos as i have told you many a times before. You capture the food, and the mood very well in your photos. Loved this one !! 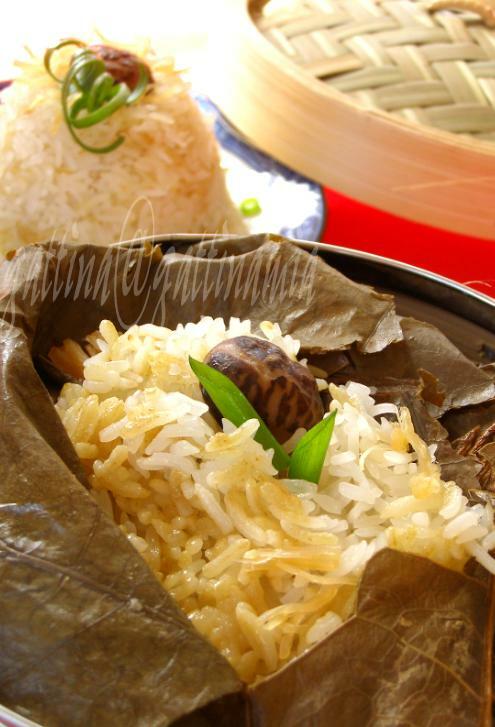 it is early Sat morning right after my breakfast, and now I am already yearning for your steamed rice in lotus leaves. You never failed to entice me with your goodies. jmom, I like to make this rich dish esp in the winter, stuffed in lots of ingredients, it's sort of comforting food to HK Chinese. Foodie's hope...we also steam rice inside a bamboo... try it when you go camping :D. Anyway, thanks for your visit! Archana, although we haven't seen each other, I feel we're pal! Thank you so much for your encouragement. Side note... there're many many bloggers took fantastic photos, one girl only her pics giving me the same feeling as what you just described, I forgot her name (Japanese) but remember her blog's called "she who eats"
Edith, thank you! Same here, cheese brownies and cheese buns are all over my head! Just fantastic. I think I've had this for dim sum before. Your photos are great. I love seeing what you've created. Can we use fresh lotus leaf? I've a pot of lotus plant at home. Some people said the leaves of the red lotus should not be used only the leaves of the white ones can. Do u have any idea about this? Delia, I've looked up the package it didn't mentioned the type of lily; sorry about that I have no idea. When other recipes call for glutinous rice, do they mean sweet mochi rice?